Polar bears, they come in pairs. like petals around a flower. So have you figured out how it's figured out? NCTM's Illumination site has a wonderful lesson for this puzzle. Tradition requires me to never post the solution. 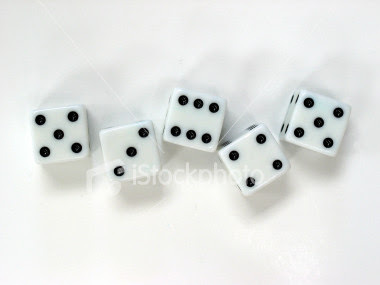 After you figure out the answers, can you derive any equations to solve this puzzle for any combination of dice tossed? When you solve the puzzle, you deserve membership in the Polar Bear Club!